Thank you notes for business are written differently thank you notes for nearly anything else. It is important to remain professional while also being able to appropriately convey your gratitude. Lets go over some sample thank you notes that would be appropriate in a professional business setting. Creating generic business thank you notes to customers will save you time and still get the message of gratitude across. At HomeWorks, we strive to give you, our customer, exactly what you want. Thank you for making us the leading supplier of home office supplies in the industry. Using sample business thank you notes like the one above, you can tailor the note to your own personal business needs. If you want your thank you note personalized you can create a template that will allow you to go in and change the name of the recipient. Here at National Groomers, We understand what our Customers want. We too love our furry family. You want the best products you can find for your four legged loved ones. Thatâ€™s why we use the finest ingredients to create our premium grooming products. Thank you for your October 8th order. We look forward to doing business with you again. Examples of business thank you notes like this are longer, more personal and make the customer feel more important; you can use the same one for just about any customer, all you need to do is switch out the customerâ€™s name and the order date. Iâ€™d like to personally thank you for choosing Lane Wakers for your Christmas shopping needs again. One of Our top shoppers, Neil Wethers will be handling your list of this yearâ€™s gifts. I noticed that this yearâ€™s list is considerably longer, but do not be concerned, Neil is on top of it and I am certain that you will be completely satisfied with our service again. If you need to make any changes to your order, feel free to call Neil at 555-555-5555. Particularly influential clients, returning clients or very large orders deserve a personal thank you. Keeping the money coming in is the most important part of business and everyone likes to be appreciated. Taking the time to tell your best clients that you are grateful for their business is just good business. Dear Mrs. Emma Lake, Mr. Jonathon Walkers listed you as a referral to our Business. As a way of thanking you, Iâ€™d like to invite you to enjoy a free session. As you know, we do not advertise our personal hypnosis services. We rely instead on the word of mouth recommendation of our satisfied customers like you. Even if you use regular advertising, the best and most reliable advertisement, as everyone knows is a recommendation from a friend. When a client thinks highly enough of your services to refer someone to you, you should return the favor and thank them. If a free session is not an option, a free gift: a pen, coffee cup or tee-shirt with your companyâ€™s logo would be appropriate, not to mention another opportunity to advertise. Sometimes, things go wrong. A part sits on order for longer than planned or the end product is just not exactly what the client wants and has to be redone. When this happens, it is often a good idea to thank your client for their patience. It is good to know that your complaint is being addressed and that your feelings acknowledged. Sending a quick note shows that you understand and can keep a valuable client from seeking service elsewhere. Thank you for your comments on January 24th. We will be looking into the matter immediately. We are customer oriented here at the Bracelet Outlet and we are grateful for the opportunity to solve any concerns with our service that you may have. 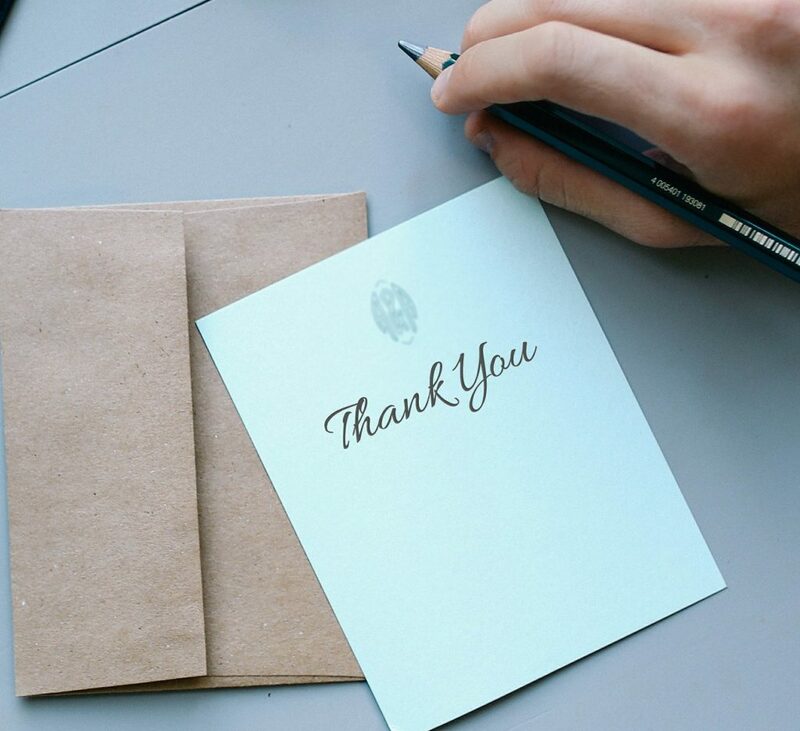 Using the generic template you can make your thank you note personalized with simple changes that make this letter and your customer feel more important. Thanking someone for complaining sounds counter intuitive; however, they can be the most important and professional thank you notes you may write. It lets the customer know that you want to please them and that they matter. Any one of these business thank you notes samples can be adapted your business to enhance your customer relations. If youâ€™re mailing a lot of them, consider postcards, business thank you cards still lend a personal touch that customers appreciate. Want a free critique? Write "Edit" in the title, and one of our editors will help you with your thank you wording, grammar, and tone. © 2019 thank-you-notes.com - All rights reserved.